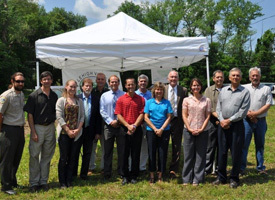 EASTON (April 26, 2016) – Delaware & Lehigh National Heritage Corridor (D&L) will announce 15 local recipients of state mini-grant conservation awards at a gathering in Upper Saucon Township on May 10 at 9:00 a.m. The celebration is hosted by Upper Saucon Township at the 70-acre Upper Saucon Township Community Park, located at 3231 Preston Lane, one-half mile east of State Route 378 in Center Valley. The location is the future site of a 2016 mini-grant project, where the Township will embark on a comprehensive sign replacement and wayfinding project to make vital information clearer and more uniform to park visitors, provide easier navigation along park trails, and improve wayfinding for the Saucon Rail Trail. Lehigh Valley Greenways 2016 mini-grant awards announced at the event will provide $77,000 of funding to local projects in Lehigh and Northampton Counties matched 50:50 by the awardees or additional partner funding sources. The mini-grant awards are part of Lehigh Valley Greenways Conservation Landscape program, administered by D&L and funded by a grant from the Pennsylvania Department of Conservation and Natural Resources (DCNR), Bureau of Recreation and Conservation, Environmental Stewardship Fund. The Delaware & Lehigh National Heritage Corridor is a 501(c)3 non-profit organization that preserves historic pathway that carried coal and iron from Wilkes-Barre to Philadelphia. 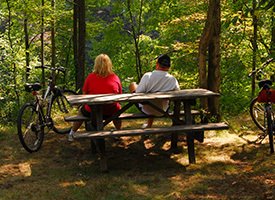 Today, the D&L Trail connects people to nature, culture, communities, recreation and our industrial heritage.